My Newly Framed T206 Cards! I finally got around to having some of my T206 cards framed and thought I'd share! The coolest part: The frame is custom made to hold SCG slabbed cards (the black around the cards is the actual holder), and the back is removable so I can swap cards in/out as I please. I'm pretty excited about it. My master plan is to have two more frames made: One for a set of four 1933 Goudeys, and one for a set of four Cracker Jacks. If you'd like to help, see my wishlist below. Last edited by Tex; 09-15-2009 at 07:41 PM. nice, did you do that yourself or was it bought that way? Had it custom made at a local frame shop. Very nice, that's a super way to enjoy your cardboard. Any way we get the name and contact info of the frame shop? i'd like to get something similar done for psa holders. three frames holding 4 cards each with the large matting would look great side by side. That looks really neat! Thanks for sharing. Kelly's Art and Frame in Alexandria, VA. It cost around $200. I didn't shop around, I'll gladly pay anything reasonable for good and trustworthy service in this city. Last edited by Tex; 09-15-2009 at 09:20 PM. Wow that is really fantastic. Nicely done! like yourself, i've beein using the best framer around--with little concern for cost-- so these treasures will be treated with the reverence they deserve. And the ability to change the cards in your display on a whim is great. Wow, only $20? That means you could display 90 cards for the price of 4! That's a little closer to my budget. Those look great, but I wanted one that would hold one of each HOFer(minus Plank and Wagner) so a friend and I came up with this that holds 36 cards. I do not collect cards but after seeing this wonderful display I may have to start. Looks Killer! Very nice Tex !!! They really did a great job- looks awesome !! Very nice Tex thanks for sharing. They need to be displayed..afterall they are works of art! Looks great. I like the way that the black SGC inserts matte the cards in the frame, and that you can swap out cards as you wish. It's a really classy way to present these little gems. Kind of like your own Burdick collection. (I took these snapshots at the Metropolitan Museum of Art in NYC a couple of years ago. There were about 15 or so framed card groups from various vintage and modern issues tucked in an obscure corridor that I happened to stumble across on the way to viewing the Washington Crossing the Delaware painting. You fellas are aware, Ted posted this 15mos ago? Better late than never I reckon... what the hay, Nice looking frame Tex. Oops. Tex's last post on Net54 was in July. Good on ya, Tex, wherever you may be. they also work good for signed Perez-Steele post cards. Thats funny, I didn't even realize the this was over a year old ,,,,,,,,still-nice job (everyone else's frames look great too). It's an old post,but still a good subject to revisit and add to. Thanks for sharing. They look awesome. Last edited by David R; 12-30-2010 at 01:14 PM. 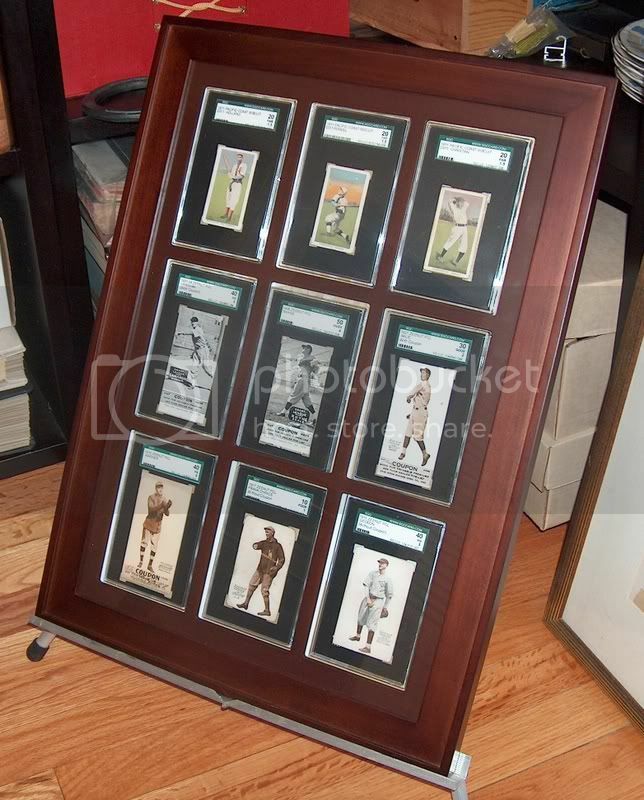 I know Barry Arnold displays his framed cards. Per earlier in thread, custom framing at a shop. Anyone do their own custom framing? I tried custom framing for first time for Christmas, a Football ticket for a relative. Came out good. However, a ticket doesn't weigh anything. Anyone try and custom frame a graded card? Or even non graded? Is this via doing a cut out of matte? Be ethical at all times.